I'm sure you are familiar with the striking awareness graphics created by Klara Wilson of "ME Awareness Pics". Sadly, Klara is no longer with us, but her legacy remains as ME warriors around the globe continue to share her pictures daily. I thought is was sad that her Facebook page, which is referred to on most of the graphics, is no longer online and thought that it would be wonderful to have a place to collect all the amazing ME awareness pictures. Not just Klara's, but also the new ones that so many creative warriors are continuously designing. And so, ME Awareness Pictures was born. A community project you can contribute to. What Is ME Awareness Pictures? A collection of awareness and advocacy pictures for you to share. A place for you to share graphics you've made with the community. Features stories from many ME warriors who will share the realities of life with ME. A way for the ME community to raise awareness and connect with others. It is not a place for memes and jokes about life with chronic illness, there are many other places for those. This is where you will find powerful, honest, to the point graphics to share on awareness days. I've created a Facebook community page where we upload any awareness graphics we find online. From here our community can easily share the pictures whenever needed. No more hunting the internet for ME infographics or advocacy images. Follow us on Facebook at Facebook.com/MEawarenessPictures! You can contribute to the collection by posting pictures directly to the page or send us a message with the pictures you have found or created. Any submitted graphics will be uploaded to all our accounts and credited. If you have installed a repost app on your phone or simply take screenshots, you can easily share pictures from our Instagram too! You can share awareness graphics to your grid or to your stories. Follow us on Instagram @MEawarenessPictures! You can help us grow our collection of awareness pictures by tagging @MEawarenessPictures or #MEawarenessPics in the comments of any awareness graphics you find on Instagram. We will repost and give credit as always. We have a lovely Twitter profile too - it's at @MEawarePictures! All the pictures that are shared to Facebook and Instagram are also tweeted on this profile. From here you can easily retweet any of our awareness graphics - a great place to source content for ME Awareness Hour on Wednesday evenings too! #MEawarenessHour is on Twitter every Wednesday at 8pm GMT / 3pm EST , you can share your own experience, ME research, media coverage or simply retweet content from the community. One hour to stand together and make some noise. Come join us! Follow us on Twitter at @MEawarePictures! You can help us grow our collection by tagging us on any awareness pictures you find on Twitter. Use the hashtag #MEawarenessPics or tag us using @MEawarePictures on any awareness pictures you find and we will retweet them. We have a group board on Pinterest where you will find all the ME Awareness Pics that we've collected. This will make it easy for people to save, share or repin the pictures directly from the Pinterest website or app. This board will give you access to a good supply of awareness graphics when awareness week comes by again! Follow the ME Awareness Pictures Group Board on Pinterest! Why not become a contributor on the ME Awareness Pictures group board? That way you can pin any awareness images you make yourself or find online. Get in touch with me if you'd like to be added to the ME Awareness Pictures board. You can send me a message on Pinterest or click here to send me an email. I will need to know your Pinterest username or an email address so I can send you an invitation to the group board. At least once a week we will feature ME warriors on all our profiles. You can be a featured warrior too! This is a great way to let others know they are not alone and to help raise awareness of the realities of ME. All you have to do to be featured is send us a DM (private or direct message) on whichever platform you are using. If you prefer email, you can find my email address at the end of this post. Just put "ME Warrior" in the subject line. A photo of you - if you do not show your face online, you may send a photo of your view from your sofa or bed where you spend most of your time. A short bio - just a few sentences about yourself and life with ME. A link to your social media account or website we can link back to. You will be tagged on the feature and your link will be added so people can find you online if they want to connect. 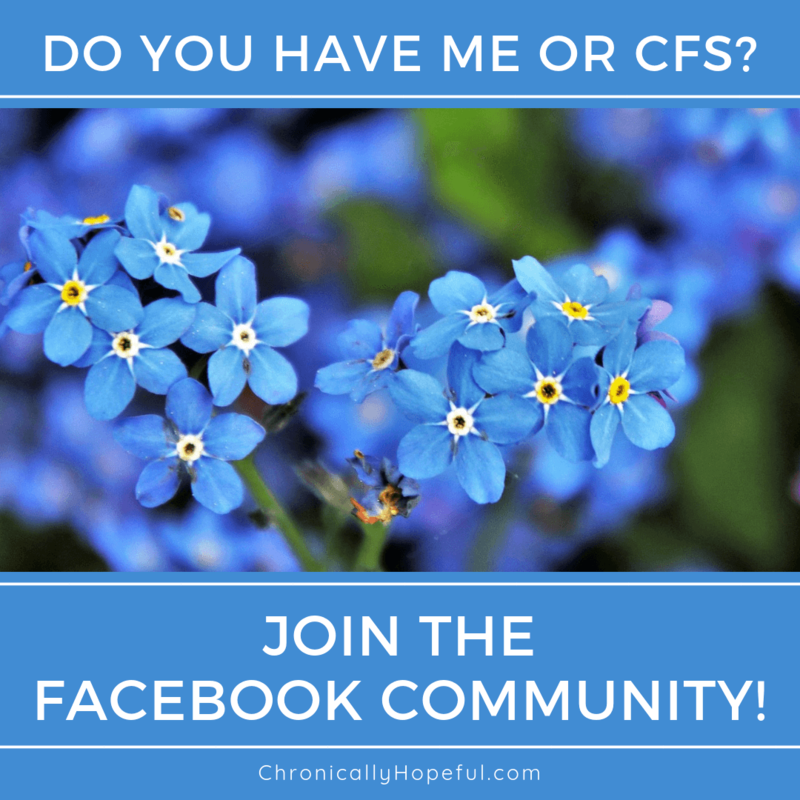 If you'd like to share more than what will fit in a tweet or instagram post, you might be interested in being featured on this blog too, we share a chronic illness warrior story twice a month. Click here to take part in one of our interviews or just email me your completed story! You will see on our posts that we try to credit the creator of each of the pictures we share by linking to their profile or website. We really want to support the ME community and that includes supporting the creatives who spent time and energy designing such striking awareness pictures! If you find your graphics on our pages without a credit, please get in touch. If you are a creative and have designed some graphics I have not yet featured, please get in touch or upload your graphics directly onto the Facebook page. My hope is that this community project will be easy to use, helpful and informative. Not only for the ME warriors who tirelessly advocate and share their experience whenever they can, but also for the family, friends and carers who often have to answer difficult questions about us and our condition when a picture really can be worth a thousand words. Please let me know in the comments if you have any thoughts or suggestions about this project, I'd love to hear your ideas! Very interesting. It’s great that there are so many awareness images out there available for ME/CFS. Yes! When I first fell ill it was so hard to find them, so I feel like having a place to collect them all, and linking to all the various designers, would be a great help when awareness days roll round or newly diagnosed patients need to explain their condition without much effort. Fantastic service to our community, Char! Thank you so much for organizing this. Thank you so much, Ros. I’m sorry for your loss. Klara has made such an impact in our community and her graphics will continue to do so for years to comme. I am so happy that you are interested in contributing to this project. I’ll be in touch.